ABIDJAN, June 2, 2016 — The Ivoirian government has a critical opportunity to define and implement a reparations policy that responds to the needs of the most vulnerable victims of the political, military and social crises experienced by Côte d’Ivoire between 1999 and 2012, according to the International Center for Transitional Justice (ICTJ). This opportunity derives from the recommendations delivered by the National Commission for Reconciliation and Victims Compensation (CONARIV) in a report to the government on March 17. CONARIV was commissioned by the President to identify the victims and to recommend reparations policies for them. The report is the culmination of a process of consultation and dialogue led by CONARIV with victims in different regions and with the participation of civil society organizations. In support of CONARIV’s work, ICTJ engaged with victims from some of the most seriously affected parts of the country for more than a year, holding consultations with 218 organizations of victims who would not have been involved in the processes otherwise. It also provided technical advice and coordinated efforts with government entities like the National Social Cohesion Program (PNCS) and the Ministry of Solidarity, Social Cohesion and Victims Compensation, which is now responsible for implementing reparations. “Victims had expressed to CONARIV the need to prioritize the most vulnerable among them, and that reparations include a comprehensive set of measures, including psychosocial support, rehabilitation, education for children and symbolic reparations, and not only compensation,” said Didier Gbery, program officer at ICTJ. “When reparations are defined with the participation of victims they can be more effective and add value to the policy, recognizing victims’ sense of agency,” he concluded. 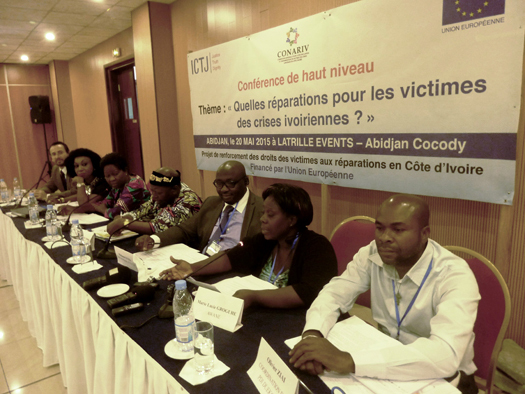 *PHOTO: Victims' representatives gather in Abidjan in May 2015 to discuss reparations policy.